Background: Education about diet and exercise for women with gestational diabetes mellitus (GDM) is integral for effective management. The ad hoc method of GDM education at the Central Coast endocrine antenatal clinic was rushed and time poor and found to be ineffective. In 2010, a structured GDM group education model (GEM) was implemented. In this model, women have access to a 2-hour group session with the diabetes educator and dietitian within 7 days of diagnosis. The session emphasises the importance of diet and exercise in GDM management. This is followed by individual consultations with the endocrinologist and multidisciplinary team at the next antenatal clinic. The model aims to empower women to make informed choices about their diabetes management. Aim: To evaluate the GDM-GEM regarding the number of women able to manage on diet only and on associated adverse outcomes during pregnancy and childbirth. Method: A retrospective review of the ObstetriX database was undertaken one year pre- and two years post-GEM. The audit included demographics, diet/insulin therapy, and obstetric outcomes (gestational age, birth weight, mode of delivery). Results: The baseline characteristics of the groups were not significantly different. 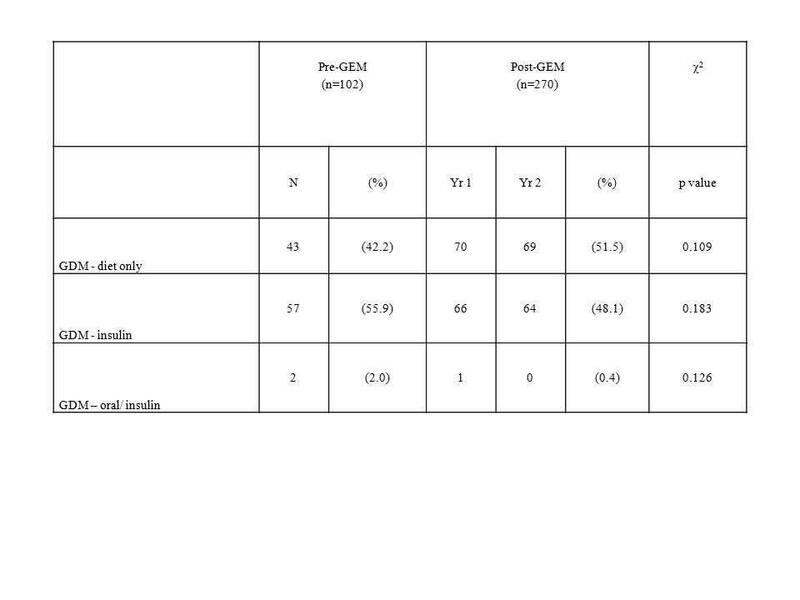 The table shows GDM treatment modalities.Overall, there was a slight decrease in the prevalence of women requiring insulin since GDM-GEM commenced, although statistical significance was not reached. There was no difference in obstetric outcomes. Conclusion: Group-based education is an efficient way of providing targeted education to women with GDM. Although the frequency of women requiring insulin was only slightly reduced, continuation and further evaluation of the model is warranted.